A filling is a material used to restore function to missing tooth structure. Tooth structure is often missing due to decay (cavities). Dr. Finley only uses composite, which are white tooth colored fillings. It helps keep the natural look of your teeth. A filling may last many years before it needs to be replaced. Constant stress from chewing, grinding and clenching teeth may eventually cause a filling to chip, crack, wear down, or fall out. 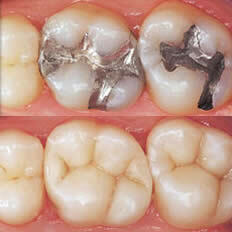 When fillings are worn, gaps are created at the edges of the filling, allowing an entry for decay causing bacteria. It is better to replace a filling before decay begins. Dr. Finley will take digital photographs and x-rays to show you just where the decay is beginning. We will help you with a plan of treatment to get your teeth back in healthy order. Our goal is to make you feel comfortable. With the gentle hands and the professionalism of Dr. Finley we are able to achieve this every day.